New Liberal government set to change course on environment, climate change policy. 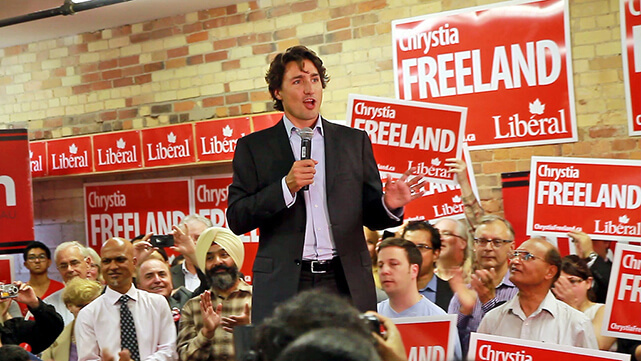 Monday night saw Justin Trudeau’s Liberal Party swept into power in Canada with a majority government. What does this mean for Canadian environmental, energy and climate change policy? CK alum Tyler Hamilton explains how Trudeau has a chance to improve the country’s environmental record, while Time Magazine examines why the election is good news for the fight against climate change. DeSmog Blog, meanwhile, breaks down Liberal election promises regarding climate, environment, science and transparency. Who will be Trudeau’s Minister of Environment? The confetti was still falling as speculation began around which Liberal MPs will be picked for Trudeau’s cabinet, including the post of Environment Minister. The National Observer has a useful roundup of the potential candidates, including former B.C. Environment Minister Joyce Murray and David McGuinty, an MP who previously worked as the president and CEO of the Prime Minister’s National Round Table on the Environment and the Economy. Over at The Star, Chantal Hébert makes the case for former federal Environment Minister Stéphane Dion. The Obama administration announced Monday that 81 major companies have committed to large reductions in carbon emissions, part of a broad push by the White House to show progress ahead of international climate talks in Paris this year. While many of the newly announced commitments were in fact issued before, part of the White House campaign is designed to reinforce the image that the United States is increasingly serious about making significant reductions in its carbon footprint. Apple, Dow Chemical and Levi Strauss & Co. are among major U.S. corporations that have decided to publicly support the Equality Act, designed to protect all LGBT-identified Americans in federal law. The proposed legislation is expected to face tough opposition from Republicans. But the timing appears right, coming on the heels of the U.S. Supreme Court’s landmark decision that legalizes gay marriage in the United States. Putting wind turbines in the ocean remains more expensive than onshore development, but this hasn’t slowed growth of the offshore wind market – at least not in Europe, where the sector is experiencing its biggest year yet. A total of 584 offshore wind turbines were put into service in the Netherlands, Germany and the United Kingdom during the first half of this year, adding 2,300 megawatts of capacity to the European grid. Did you know a shocking 19.9 per cent of Americans have been on at least one cruise throughout their lives? And an estimated five per cent of global emissions are due to tourism? Corporate Knights has compiled a selection of statistics on the travel and leisure industry that you likely didn’t know, complementing the travel section in our latest print issue of the magazine.